Two weeks were all we had to redesign the Information Architecture(IA) of the Singapore Polytechnic’s website. Three personas (Prospective student, Current student, Alumni looking for professional development) were identified and given to us and the Information architecture was designed with them as reference point for the redesign. The goal is to create an experience for the user that is as natural and comfortable as possible without creating resistance to business needs — the perfect flow. First order of business – Dissect the website and analyse the content. Conduct research study on the given user groups — which includes understanding routines and behaviours related to the use of the website. And the attitudes and values towards what they see on the website. Mapping out the content on the website into a sitemap makes you feel like a small little fish swimming in the deep sea — where exactly am i? From the sitemap, we could easily see that many of the contents within the site were duplicated but categorised under different labels. There were also navigation (supposedly) specially categorised for the different user groups — Students, Teachers, Staff, Alumni and Media. But are they really categorised to the needs of the user groups? We will find out later. Screenshots of some of the layouts on the current site. Multiple contents featured on the homepage. The order of the contents are ordered in a way which focuses on what the school wants the students to know first, followed by what the students might want to know. Broad categories under the “Student Service” section. Navigation labels were not intuitive, clear and meaningful. Multiple level of contents under one navigation bar. Users suffers from “click fatigue” to locate informations. Too many information and call-to-action on a single carousel banner. Accessibility and Clarity of information can be improved. Content heavy page with no design hierarchy. After evaluating the website, I got down to setting up questions for my surveys and sending it out to people from the two user groups — Prospective and Current students. The goal was to find out the type of information that these group of users look for when they go to an academic website and also to screen users for my interview/card sorting exercise. Question asked: What are the informations you look for when you apply to a new school? Various questions were asked in the survey, but the one that stood out the most was “What are the informations you look for when you apply to a new school”. From the survey results, informations that has direct relations to admissions are the most important to them. School happenings are also a top consideration in understanding school’s life. I took this result as a reference for the cards for my card sorting exercise. 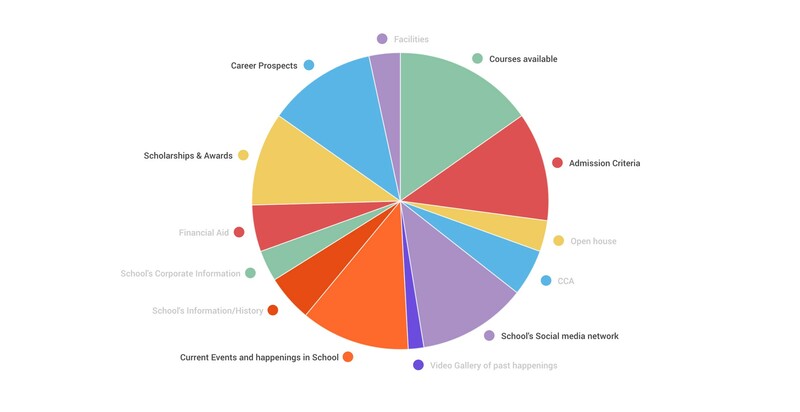 I picked up contents related to courses and admissions to see how users see them as categories. Additionally, i also picked up sections that has unique labels to find out if the user group are able to understand them. During the course of card sort, I had to probe the participants to gain more insights as to why they rename or categorised certain content. Short interviews are also conducted with the participants to understand some of their needs and pain points. These insights has helped me fully understand their motivation and decision-making process and enabled me to refine the information architecture of the website. After receiving the users’ responses, there is a degree of subjective judgement which you have to make as a UX designer to conclude the new IA going forward. It involves understanding the context to which some of the areas are repositioned by the users and forming a decisive view if that is the overall intent of your new site. 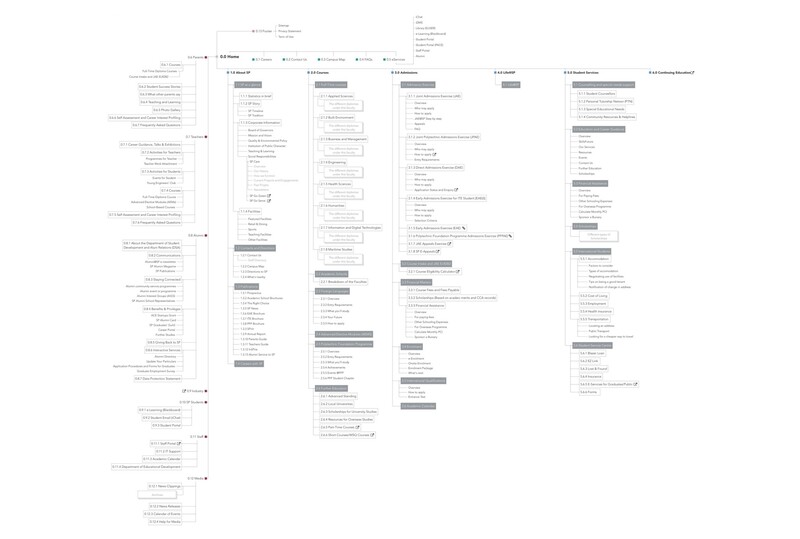 With the revised IA created from the card sorting exercises, I went on to create user flow (current and revised sitemap) based on the needs of the personas to further refine the solution. 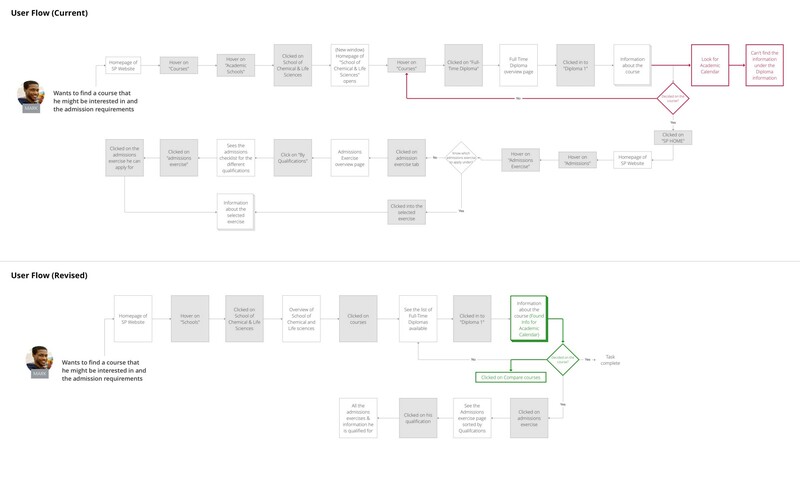 Generating the user flow enabled me to take a close look at how user interact with the site and remove redundant steps or simplify the flow of the task. It also provided justification to some of the recommendations that I would be making to the IA based on the other research & analysis that I have done. Once the new IA and navigation have been developed, I proceeded with the sketches of the wireframe to get a clearer picture. Once I got my sketched wireframe sorted, I moved on to Axure to create a working prototype. My strategy is to keep it simple. 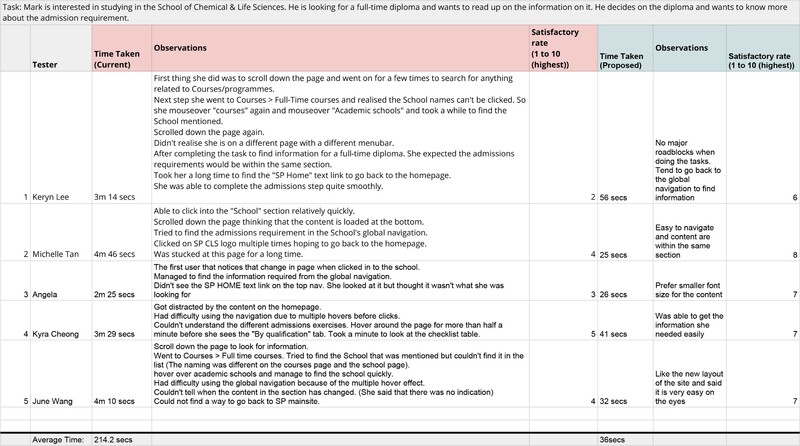 I did not spend too much time figuring out the construction of interactions but instead slog it out to simply build the pages to articulate the key user flows and contents for my chosen persona: Mark (Prospective Student). In this mobile-first era, the design of the website should be catered for the mobile platform. We should conduct research to find out the difference in user behaviour on mobile and desktop. This will help us organise the information on the mobile site and also omit information that mobile-users will not look at. Conduct a larger sample of usability testings, and iterate the design continuously. Work with content strategist and copywriter to improve overall content flow, tone of voice and key messages — good copy reduces ambiguity.